Alpha Alpha Kappa Zeta awarded its first scholarship to Miss Audri Flores an honor graduate from Northgate High School in Newnan, Georgia. Audri plans on attending Georgia State University in hopes of becoming a licensed mental health worker. Audri has participated in several community service projects alongside the Alpha Alpha Kappa Zeta chapter. Audri was surprised at her school’s awards ceremony on May 3, 2016 by the chapter with the scholarship award. 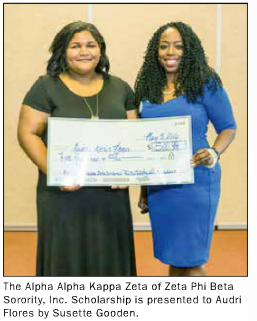 She assumed AAKZ chapter members were present at the event to show support for her academic achievements which were being recognized that evening and unaware the Sorority was presenting her with a scholarship. Audri was overjoyed when Scholarship Coordinator Susette Gooden made the presentation naming her the recipient of the $500 award. “I always wanted to get one of the giant checks,” she joked with the chapter members afterward. The Newnan Times-Herald captured the joyous moment in the newspaper.